Is the 2019 Bowflex Max Trainer M6 really the best choice for beginners to intermediate users? Could this get any more perfect? Below is what you need to know to make an informed choice. BUT FIRST, DON’T MISS: For a limited period of time Bowflex is running their 2019 spring sale. If you live in the continental U.S. you can enjoy shipping discounts, and lowered prices in the official Bowflex online store. Don’t have the time to go to the gym, but still want to step up your workout game? Well, it’s high time you think about setting up your own home gym and purchasing the right exercise equipment to go with it. This is something that requires a lot of thought because these machines can go for quite a lot these days. They promise all sorts of unique workouts and stellar results, but what is the one machine that can definitely pull through and deliver? Consider the new 2019 Bowflex Max Trainer M6. The Bowflex Max Trainer M6 is a huge step up from its entry-level cousin, the Max M3, in the Max Trainer line and offers many different features to help you get the best workout. We tested it out for a few weeks and here is what we love about this fantastic little machine. And just in time too with Spring Season coming around the corner, we’re here to let you know why you should look out for the best deals on this one. Bowflex Max Trainer M6 – What Makes It Unique? Full body engagement. Period. This isn’t going to be like running on any old treadmill. It isn’t even going to be remotely like using a regular elliptical. 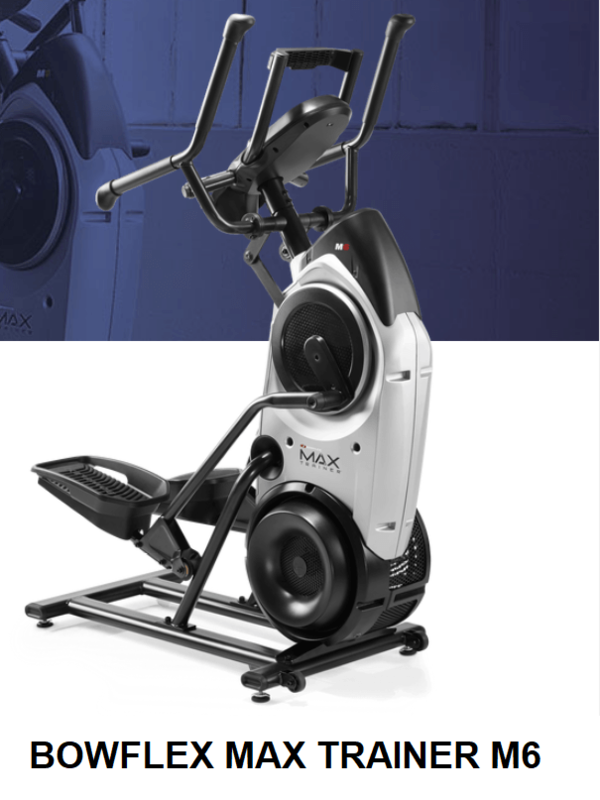 The folks over at Bowflex designed the Max Trainer M6 as a combination of an elliptical and stair climber machine. That sounds like an obvious enough combination, but this distinct design allows for more natural movement, so this is great if you feel awkward using an elliptical. Not only that, this will burn almost thrice the amount of calories. This is like hitting two birds with one stone. You’re engaging both your upper and your lower body when you use this machine. I don’t think it can get any better than this. This means doing away with your usual cardio, arm and leg work outs. Just imagine how simple it would be to not have to do these separately. I know this is the main reason why it’s such a bummer to go to the gym for me. I have to use multiple machines to engage different parts of my body and it eats away at my time. With the Max M6, you don’t have to worry about any of that. A regular elliptical machine isn’t really good for upper arm strength training. The handles are really just there for support and not much else. I’d have to use it for about an hour to feel just a tinge of the burn I want. The M6 has been specially designed for toning too, so it’s not just your regular run of the mill cardio machine. It’s any fitness nut’s nightmare to plateau. You’ve been consistent with your workout for months and you’ve been seeing steady results, and then suddenly, your progress seemed to have stopped. This is usually a sign that you need a more challenging workout regimen because your muscles have acclimated to the amount of activity that you usually do. If you’re worried that getting the Bowflex Max Trainer M6 is going to be effective for only just a while, then you can stop worrying right now. The M6 has a whopping 16 levels of resistance. If you’re a beginner or even a seasoned trainer, a machine that allows for this many levels of resistance is going to keep you from plateauing. It’s going to be a while for you to burn through all those levels and it’s not very likely that you’ll ever find the last level easy. So if you start feeling like you can handle something a little more difficult, there is the very easy option to change things up a little as you progress. If that isn’t enough, there are eight different built-in programs that vary in intensity for you to pick from wherever you are in your fitness journey. You can access these on a bright backlit display that is easy to read and follow. I used to love running, but now that I’m a little older, my doctor told me that I should go easy on my knees and find a better way to workout that has little to no impact on them. Fair enough. This is when I started experimenting with workout equipment. The Max M6 is absolutely painless to use. With its zero impact design, you can forget about the risks of getting any kind of injury on this machine. Since this not like using a treadmill, your feet will never really leave the machine and it is designed in such a way that the motion makes sense for your joints. It feels very natural and your joints will feel supported. Because of this level of comfort, this will encourage you to work out for much longer and therefore getting much better results at a faster pace. This machine is also very quiet and ergonomically designed. You could work out in the living room without bothering anyone else. Maybe you don’t have an extra room to turn into a home gym and will have to set this up in the living room. No problem. The M6 is not like one of those large, unsightly exercise machines that take forever to set up and need so much space. For what this machine can do, it’s actually kind of amazing how compact it is. It has the same bottle holder and media shelf where you can prop up a book or watch something on your tablet. 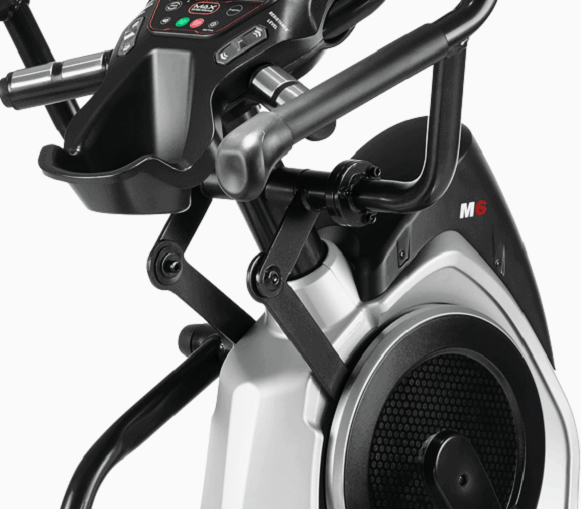 But the more notable details on the M6 are it upgraded hand grips and pedals. It also has integrated contact grips and a chest strap to keep track of your heart rate for better and more accurate monitoring. Be aware that assembly of your new M6 isn’t totally beginner friendly (but certainly not impossible for any reasonably handy person). Consider adding in-home assembly to your order, you get full assembly by a qualified technician. The Bowflex Max Trainer M6 is Bluetooth enabled, but so what? Just about everything is Bluetooth enabled these days. How can this exactly benefit your fitness plan? Well, this machine comes with a free Max Trainer app (android, iphone) that logs your heart rate and all the calories you’ve burned. With Bluetooth connectivity, you can sync your workouts with other popular fitness apps like Google Fit and Apple Health. And who needs a trainer when you can keep track of your progress yourself? 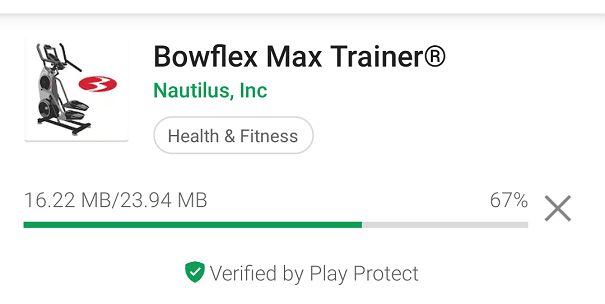 If you find yourself out of ideas on how to mix things up with the M6, the app also offers various video content from official Bowflex instructors that feature anything you might need from workout plans to motivation boosters. The Bowflex Max Trainer M6 cannot be folded and isn’t beginner friendly when it comes to assembly. If you have the extra funds, it would be a good idea to just have someone set this up for you. It doesn’t have any speakers. But you could easily just have a separate music player if you need it. This workout is hard. Even on the lowest setting, you still might have some difficulty if you’re just a beginner. This is really more suited for people with some strength to begin with. Windup: Is the Bowflex Max Trainer M6 right for you? If you want to seriously work out or already consider yourself to be an intermediate to advanced trainee, then this is the one. You don’t need to look for anything else. The Bowflex Max Trainer M6 is sleek, it’s sturdy and will be your fitness companion for a long time. It’s easily customizable for every user in your household. It can work out every part of your body in half the time without the risk of developing any joint injuries. If your goal is to wow everyone with consistent and easily noticeable weight loss, or to just strengthen and tone your muscles, the Bowflex Max Trainer M6 will be a great addition to your home gym.